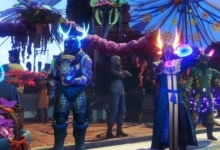 The Destiny 2: Forsaken expansion is full of secrets and challenging quests inside the Dreaming City — the mysterious Awoken homeworld. The ethereal location is bursting at the seams with intrigue and discovery as the Taken curse gets stronger over a three-week cycle. 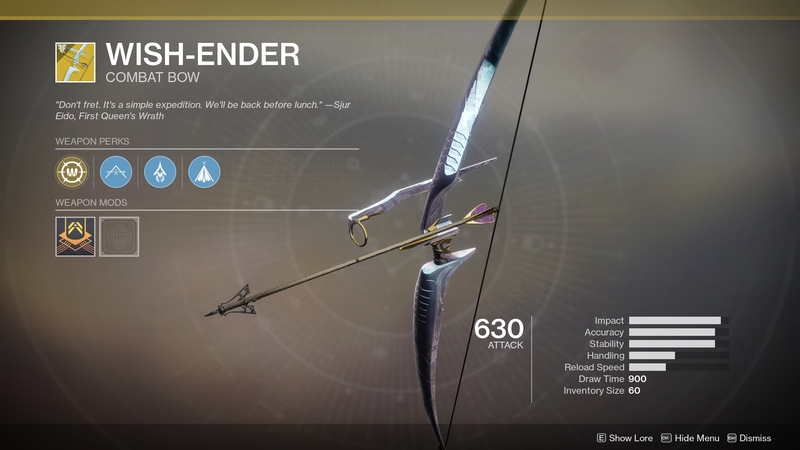 One of the Dreaming City’s best secrets is the awesome Wish-Ender Exotic bow, which lets you see enemies through walls. There’s a quest tied to hunting down the bow, so it’s time to head to the Dreaming City to make it yours. Let’s get started, shall we? The bulk of this quest takes place inside of the Shattered Throne dungeon. This miniature Raid-like activity (which Bungie calls a “dungeon”) is located within the Dreaming City. You can access it via The Confluence inside Rheasilvia. The key here is that the dungeon is only accessible during the week when the Taken curse is strongest. 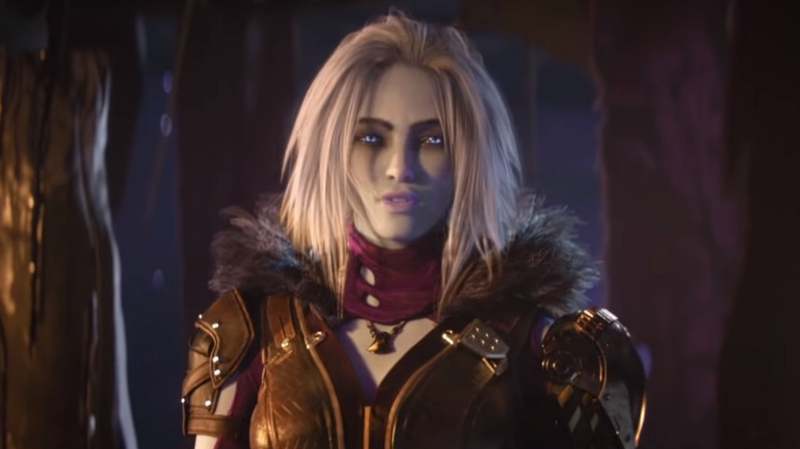 For reference, these are the weeks when you can meet Mara Sov in person at the Dreaming City. So you’re on bit of a time limit. If you miss your one-week window, you’ll have to wait for the curse to cycle again. When you’re ready, head towards the Oracle tower. Then drop down underneath the bridge to the area and head to your right, where you will find a portal. Take the portal and follow the pathways inside The Confluence until you reach a massive Taken door — along with the Techeun named Sedia. Speak to her and begin the dungeon. After you defeat the first massive Ogre boss, deep in the dungeon, you will come across a statue of the very first Queen’s Wrath, Sjur Eido. The statue is holding Wish-Ender, but it’s not yours just yet. First, you must interact with the statue. 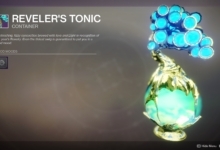 It will take your Awoken Talisman that you received as part of the Forsaken campaign. Finish the Dungeon as you normally would and the first step of the Wish-Ender quest is done! Next, head to Four-Horned Gulch in the Tangle Shore. Walk around the area with your Ghost in-hand long enough and eventually you will find a mission icon. It simply says “prove your worth.” Interact with the icon to begin another mission. The mission is pretty tame by Destiny 2 standards. That is until you reach the final room, where you need to kill three massive Taken enemies. Each of them will drop a token. These will set you off on the third step of the quest for Wish-Ender. Each of the three tokens needs to be cleansed inside the Shattered Throne dungeon. So, assuming it’s the right week, it’s time to head back to the Dreaming City. To cleanse the tokens, you need to spawn and defeat boss enemies by locating an orb and finding its matching statue. The first orb is found inside of the first encounter where you fight Labyrinth Architects. Pick up the orb in the Tower of the Deep, on top of the roof of the tower itself. Take the orb back behind you to the roof of the center building (via some platforming) and place the orb in the statue. A Minotaur will spawn. Kill it and the boss, Querim, The Waking will spawn in its stead. 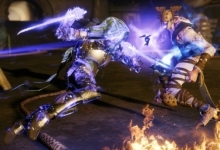 Finish the big guy to cleanse his token and move on through the Shattered Throne dungeon. The second token needs two orbs to cleanse it. The first is found inside of the giant room where you navigate across beams over a massive drop. As soon as you enter the room, the orb is found behind a pillar to the right side of the area. Grab it. You must then take the orb to the far right-side corner of the room where the statue is waiting. 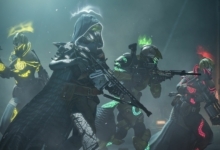 Have your other two fireteam members clear out the adds that spawn in (preferably with snipers and other long-range rifles). Be careful while jumping to the statue that is missing an orb. Place it in the statue itself and continue on your journey! The second orb is found inside of the room where you become slowed down and unlimited Shadow Thralls swarm you. When you enter the area, the orb can be found up the stairs and to the right. Grab it and navigate the Thrall hallway (or Thrallway) as usual. Once you make the long drop at the end of the hallway, the statue is found immediately to your right. Place the orb inside it and a door will open on the far side of the broken bridge. Enter through it and clear out the enemies that spawn. That will cleanse the token! The final token is cleansed during the big, awful Ogre fight. Play it like normal, but once you take down the Ogre’s shields, ignore him and quickly look around the room for a Minotaur that will spawn somewhere nearby. Kill it as fast as possible to spawn the orb you need. Take the orb to the left side of the room (as you enter). You will find the spark’s corresponding statue along that wall. Place the orb to spawn a second Ogre alongside the usual one — except this one has no shields. Finish both Ogres to cleanse the third and final token. Head on to the statue of Sjur Eido (where you go the once more and present the three tokens. You can now claim Wish-Ender for your own. 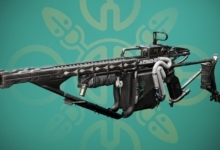 Enjoy the new Exotic bow!